Gmail, like many aspects of your Chromebook, PC or Mac, can be customized to suit your liking and personality. While some find the simple white background that comes standard in the web-based email service, I for one am not a big fan of leaving things generic. I like having a little color and more specifically, I like having things that match across all my devices. Themes and wallpapers are part of that but so is Gmail for me. My current favorite wallpaper is the default wallpaper that comes with Android Marshmallow. It is the wallpaper on both my Nexus 6 and Nexus 7 as well as the wallpaper on my Chromebook and my Windows PC. Now it is also the wallpaper for my Gmail account. To be clear, in this How To I am talking about Gmail on the web, not the Android app. Whether you are using Chrome, Internet Explorer or Safari, you can have a theme for your Gmail account in just a few simple steps. First, make sure you have the photo that you want to use as your wallpaper saved somewhere on your PC or on Google Drive so you can access it. Once you have that done, continue on after the break to see how to set it up, configure & customize it and finally share it with anyone. Once you have selected your photo then you can do a bit of customizing. Note at the bottom of the photo/theme selection box there are three icons next to the Save and Cancel buttons. These icons allow you to change the color of the text background from light to dark, change the size of the vignette of your photo and adjust the blurriness of the photo in the background. Once you have adjusted the photo the way you want it to look as your Gmail wallpaper, tap the Save button. That’s it. Now your personalized theme is set as your default Gmail theme and whenever you visit the site you will have this theme as your background. 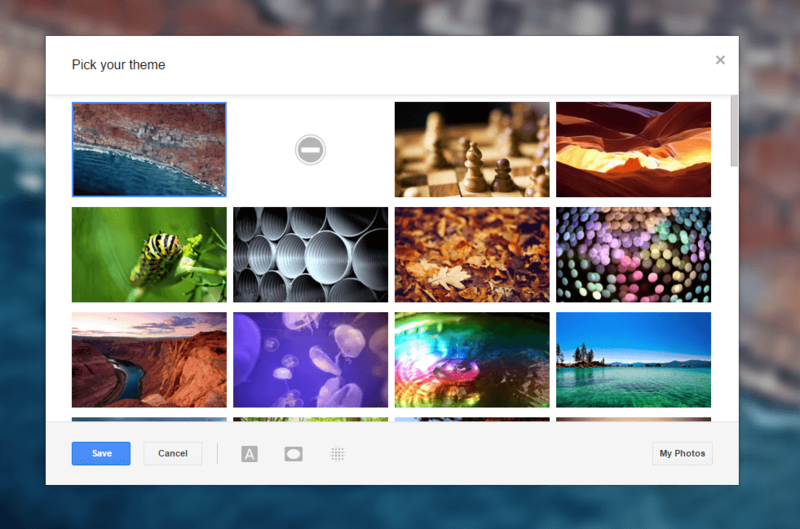 Once you have created your theme you can easily share it via Email, Google+ or by simply sharing a link. The theme you created is stored in your Google account while your photo itself is shared via Picasa. If you delete the photo from Picasa, you will essentially delete the theme. As for my Android Marshmallow theme, you can find it here and use it for your Gmail account if you so choose. For more tips and tricks as well as How To’s for Android, Chrome, Chromebook and Windows Phone, be sure to check out my How To pages.